In its broadest parameters, Disney’s “The Nutcracker and the Four Realms” hews only loosely to its source materials: German writer E.T.A. Hoffmann’s 1816 fantasy story “The Nutcracker and the Mouse King” and the two-act ballet – now a staple of Christmastime entertainment – that is based on it. Otherwise, the film, a mix of live action and CGI, is, for better and for worse, pure Disney. What that means is a visual spectacle that is wildly imaginative, dazzling and, more often than not, charming, harnessed to a screenplay (by Ashleigh Powell) that pads out the slender, dreamlike fable at its heart with an at times needlessly busy narrative that evokes “Alice in Wonderland,” “The Chronicles of Narnia” and, at its most extravagant, Cirque du Soleil. That said, the movie also includes passages of simple ballet featuring Misty Copeland. While doing little to advance the larger story, the beautiful dance sequences make for a delightful reminder of the film’s roots. The score, by James Newton Howard, also mixes in plentiful chunks of Tchaikovsky’s familiar music. As with most versions of the ballet, the story centers on a girl named Clara Stahlbaum (Mackenzie Foy) and opens at a Christmas Eve party that is attended by her father (Matthew Macfadyen) and godfather (Morgan Freeman), a toymaker of ingenious contrivances named Drosselmeyer. 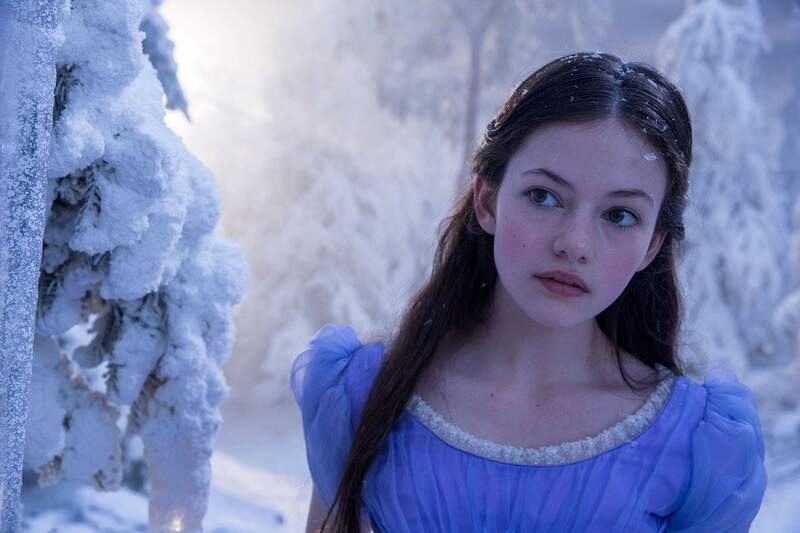 In this London-set version of the tale, when Clara wanders off in search of her present from Drosselmeyer, the key to a locked, ornate metal egg, she enters – via a “Narnia”-like magic portal – an alternate universe. There, she meets the film’s title character: a wooden nutcracker who has turned into a young soldier named Philip (Jayden Fowora-Knight). He introduces Clara to four realms: the lands of Sweets, Snowflakes, Flowers and Amusements, each one reigned over by a different regent (played to perfection by Keira Knightley, Richard E. Grant, Eugenio Derbez and Helen Mirren, respectively). In this telling, there is dissent among the regents, and Mirren’s character – known as Mother Ginger, a character from the ballet under whose voluminous skirts live a coterie of clowns – is presented as the villain. “The Nutcracker and the Four Realms” can be a little bit scary at times. The Mouse King, for instance, is a horse-size mouse-cloud made up of hundreds of squirming, normal-size rodents. Kudos to the special effects team that dreamed this thing up, but ew. Otherwise, the action is all make-believe, involving, for the most part, toys with nonlethal weapons. In the end, “Nutcracker” is a delightfully old-school diversion. The plot may not always hum with the clockwork precision of one of Drosselmeyer’s mechanical toys, but like a music box, it nevertheless plays a sweet tune.